Whether you’re a salesperson, executive, or business owner, presentation skills are vital to your success. But presentation skills are rarely taught in school, and too many companies don’t invest in such training for their people. Which means if you want to be a better presenter, you’re often on your own. Fortunately, there are plenty of resources to help you hone your skills. Here are eleven options. There are thousands of books on the subject of presentation skills, from beginner-level to advanced. Check out Amazon, your local book store, or your local library. 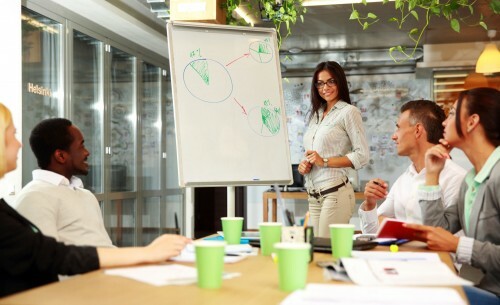 There are also thousands of videos about presentation skills, with the bonus that many of them model the principle or tactic they discuss, so you can see it in action. What we think we say is not necessarily what we actually say. And how we think we say it is not necessarily accurate either. Listening to a recording of yourself will enable you to hear how you really sound. And while it’s not fun, it will give you tremendous insights into your current strengths and weaknesses. Ask your manager, colleagues, friends, or spouse to watch you and provide you with feedback, both positive and constructive. Ask them to be painfully honest. Toastmasters International is a worldwide non-profit organization that enables people from all walks of life to develop their presentation skills in a supportive environment at their own pace. With nearly 16,000 local clubs in 142 countries, there are almost certainly several clubs near you. Many community colleges and adult education programs offer classes in speaking and presenting. Whether it’s a single evening or several weeks, it’s a good—and cost-effective—use of your time. Seminars are typically more expensive than an adult ed course, but they usually offer more advanced insights and tactics. Thanks to this cool thing called “The Internet,” it’s possible to watch lots of other speakers, with a range of skill levels, delivering a wide variety of presentations. And you can learn something from each one of them. While it’s the most expensive option in the list, a speech coach can provide you with one-on-one attention and personally help you craft every element of a presentation. If the presentation is really important, a speech coach is a solid investment. The power to be a better speaker is in your hands. Presentation skills are among the most valuable skills you can strengthen, and they will serve you in situations beyond sales calls. They will improve your commissions, your career, your image, and your impact. By the way, if you’re a CEO or sales VP, consider bringing in an expert to train your sales team. The better their presentation skills, the more deals they’ll close for you. Don’t Be So Quick to Answer! Are You Taking Care of This Person Well Enough? Speaking of Prospecting . . .
Is Buying From You Too Risky? What Does Your Price Say About You? Are You Being Too Accommodating to Your Customers? How Badly Do You Want Others to Succeed? Do You Care About the Wrong Thing? Are You Treating Your Salespeople Too Well? What Do They Need YOU For? Is a Leads Group Right for You? Are They Really a Prospect or Are You Just Wasting Time? Are You Taking Enough Time Off? What’s the Opposite of a Good Idea? Who’s On Your Sales Team? Who’s to Blame When Sales Are Bad? Are Your Salespeople Too Cheap? Are You Making Your Prospect Uncomfortable?